In the New Testament the most commonly used word to describe a follower of Jesus is a disciple. There are 7 different titles given to explain who/what a Christian is but disciple out ranks them all for sheer volume of usage. The word is used as a formal noun to refer to the twelve apostles but from Acts onwards it's used simply to mean any number of people who are part of the church: Acts 6:2 'the twelve summoned the full number of disciples...' 6:7 'the number of disciples increased greatly'. It seems that 'disciple' is the word of choice to refer to any average Joe-saint or christian-Christian. If you're a follower of Jesus (or the Way), a Saint, a Christian, a brother/sister in Christ, or one who 'calls upon the name of Lord' (or whatever you like to call yourself); you are a disciple. A disciple is a student and an imitator and as such we are, each of us, called to imitate and learn from Jesus. In Matthew 28 Jesus makes an incredible claim to be in overall charge of the world and then instructs his disciples to go and 'make disciples' from every nation on the planet. Jesus and the New Testament makes it quite clear; every disciple is to be a disciple maker. Now, upon reading that, many will instantly and subconsciously replace the word 'disciple' with 'convert'. The thought being that the two words mean largely the same thing. 'My job,' people think 'is to turn unbelievers into believers' and since very few of us do that too often many of us find ourselves living under a cloud of guilt and heaviness as though we're falling as disciples. Thinking like this heaps a whole load of heaviness onto an otherwise light and easily-yoked Christian existence. "Therefore go and make disciples of all nations, baptising them in the name of the Father, and of the Son and of the Holy Spirit, and teaching them to obey all that I have commanded you. And surely I am with you always, to the very end of the age.' Matthew 28:19-20. In response, I think the answer is 'specifically and all' and 'yes, but also'. Let me explain. Everything Jesus said to any other specific group of people was intended to be heard by and applied by, specifically, those people. Having said that we see from Paul's life and the life of other believers in Acts that every one of them took it upon themselves to 'make disciples'. When Paul visited new places and discovered believers already there it was because the saints who'd got there first quite simply got there first. Where they went they shared with anyone who'd listen to them, the news about the crucified and risen messiah. It's been said by church historians and sociologists that the spread of the Christian faith was due more to the 'gossiping on street corners' of everyday believers than it was to do with the 'shouting from the roof tops' of Christian leaders. Every Christian is called to be a disciple who makes disciples. Secondly Jesus did mean for them and us to 'get people across the line of faith' but he also meant much, much more. Many of us can quote the front half of the commission from memory 'go and make disciples of all nations, baptising them in the name of the Father, Son and Holy Spirit,' where, I suspect, many a Christian's memory fails them is in the quoting of the back half '...teaching them to obey all that I have commanded you, and behold I am with you even until the very end of the age.' This is a problematic memory fail as it imposes to narrow an understanding of what disciple making is all about. The disciple that Jesus has in mind for us to make is much more than 'a line crosser' or a census box ticker. A disciple is a learner, a follower and an imitator of Christ and every Christian is called to be both a disciple and disciple maker: ed=dm. This means that each and every Christian is to intentionally play a crucial and much needed role in disciple making. It means that between us as the church we ought to be very good at harnessing all of our gifts and abilities to make disciples. Disciples who learn and grow and give and take risks and make other disciples. The descriptions and metaphors of the Christian (life) in the New Testament are almost always active: disciple, follower, believer, athlete, soldier, farmer. Notice: a Christian is not simply 'one who believed on Christ' (past tense) but one who 'is currently and ongoingly believ-ing' (present and future tense). With that in mind, we never stop being students/imitators/followers of Jesus and therefore (since it is part of being an imitator/follower of Jesus) we never stop making other students/imitators/followers of Jesus either. 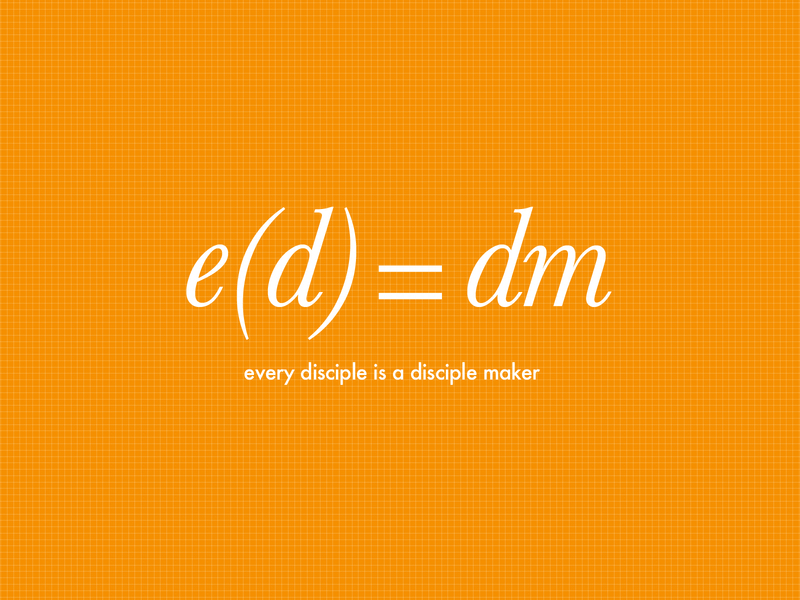 So, what does it mean to 'make disciples'? 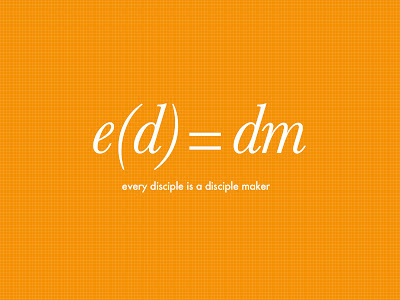 What does it mean for every one of us to be a disciple maker? Typically it's not something we talk too much about and yet, given the commission, it ought to be something that each of us are mindful of and working towards in our day to day lives. It isn't something that only a handful of Christians are called to do; church leaders, life group pastors or staff members perhaps - it's for every disciple: ed=dm. "The reason the UK church is not effective in mission is because we are not making disciples who can live well for Christ in today's culture and engage compellingly with the people they meet... Jesus had a 'train and release' strategy while overall we have a 'convert and retain' strategy." Life on life discipleship in cafes, pubs and places of work that involves study, activity, prayer and honest conversation is what's needed. What we need is more risk taking, schedule reshuffling, initiative taking discipleship.The truth is that we'll never build the kind of church we carry a longing for until each of us personally rediscovers and takes responsibility for disciple making. ed=dm. Do you believe it? Are you doing it? This is the subject we're digging into at Kings Seaford this summer. We're going to be discovering how every one of us already has everything we need to make disciples and we're going to be looking at how corporately and individually we can carry out the commission Jesus has given us. Join us through August as we continue to be the church we want to build.